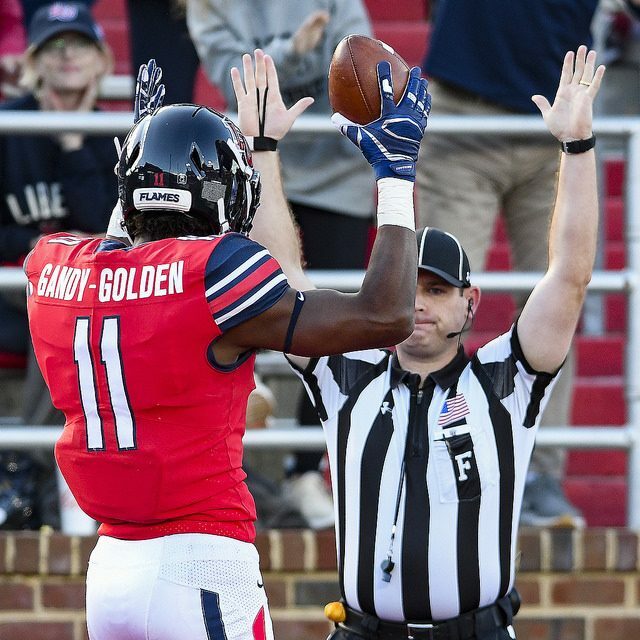 In what is likely to be the most anticipated Liberty signing day in recent memory, perhaps ever, the Flames are prepared to officially welcome several new faces to the football program Wednesday. Caper pledged to Coach Freeze and the Flames back in December, the first commitment after Freeze was named head coach. He attends Grapevine Faith Christian School in Grapevine, Texas and also had offers from Syracuse, Colorado, Texas State, SMU, Navy, Tulane, New Mexico State, and others. He actually signed in December, but it will become official now. Douglas is a small, speedy wide receiver from Mandarin High School in Jacksonville, Florida. He had an electrifying state championship game with 4 touchdowns to help lead his team to a state title. He also has offers from FAU and UAB. He actually signed in December, but it will become official now. Green also has offers from Western Kentucky, Southern Miss, UAB, and others. He will have 3 years of eligibility remaining, as he comes by way of Jones County Junior College. He’s originally from Albany, Georgia. Knight has visited Lynchburg twice, once in January and once in December. He’s currently at Ventura College and is originally from Salt Lake City, Utah. He went to Ventura immediately following high school, after just one season he picked up numerous offers and committed to Arizona. He attended there for 2017, redshirted, and transferred back to Ventura for the 2018 season. He has 2 years of eligibility remaining. Shepard-Creer is a New Mexico State bounceback that is currently at Santa Barbara City College in California. He has 2 seasons of eligibility remaining. He actually signed in December, but it will become official now. Buys visited campus on January 18th. It looked like Liberty was the front-runner for the Vicksburg, Mississippi product, but following a visit to Mississippi State this weekend, that could be questioned. There hasn’t been any public statement of an offer from the SEC school, but that could have happened over the weekend. Other offers include Georgia State, Louisiana Monroe, and South Alabama. Clark seemed to pop onto the radar out of nowhere this weekend, taking a visit to Liberty. He attends Manchester High School in Midlothian, Virginia and is the perfect example of a late bloomer in the recruiting process. He didn’t begin receiving any FBS offers until after his senior season started. As he helped lead Manchester to its first ever class 6 state championship, FBS teams began to take notice. He picked up offers from Charlotte, Marshall, Western Michigan, and Akron. He took a visit to Charlotte December 15th and was committed to the 49ers under their former coaching staff. After the coaching change, Clark de-committed. He’s also taken visits to Western Michigan, Marshall, and Kent State. Playing both receiver and defensive back, Clark collected 25 receptions for 471 yards this season. His eight touchdown receptions led all receivers for Manchester. He had 23 tackles, 3 tackles for a loss, and 5 interceptions on defense. He earned All-State first team honors at wide receiver and second team honors at defensive back and punt returner. Virginia Tech, UMass, and JMU have also shown interest. Edwards was part of the group that visited on January 18th. He spent the following week at Louisville and was scheduled to be at Ole Miss this weekend. He’s kept much of his recruiting pretty quiet. Harris was offered under Coach Gill’s staff, but the new staff also expressed interest, offering him a couple weeks ago. He has visited Lafayette, Western Carolina, and Army, and has announced he will be making his decision publicly on signing day. He has not taken an official visit to Liberty, making it difficult to envision him signing with the Flames. It could be that he’s a fall back option for the Flames. Harris also visited Lynchburg January 18th. His prior visits include South Alabama, Southern Miss, and Tulane. The Montgomery, Alabama prospect visited Kansas this past weekend. He will likely choose between the Jayhawks and the Flames. Les Miles vs Hugh Freeze. Hicks visited Liberty on January 18th. He then visited East Carolina the following weekend. He’s originally from Pensacola, Florida and is currently at Hutchinson Community College. James is from Iowa Western Community College. He committed to Kentucky on December 16th, but decommitted early last week. He also has an offer from Southern Miss. He recorded 57 tackles, 16.5 tackles for loss, and 8.5 sacks this season. He visited campus this past weekend. Merritt attends Colquitt County High School in Moultrie, Georgia, coached by Rush Propst. Propst is the legendary high school football coach that was featured in the MTV series Two-A-Days when he was head coach at Hoover High in Alabama. Merritt has more than a dozen offers including Georgia State, FAU, MTSU, Pitt, South Alabama, West Virginia, Tulane, and UAB. After a weekend visit to Liberty, he announced on twitter he was deciding between the Flames and FAU. Lane Kiffin vs Hugh Freeze. Myers-Glover is an interesting one. He visited Liberty on January 18th and then Louisville the weekend after that. Despite appearing to be in the driver’s seat, it seems as though Louisville has backed off of him at the last minute. 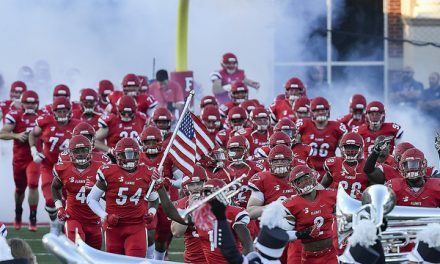 With it being unclear where Liberty stands, FCS member South Dakota has come into play. It doesn’t appear that Liberty is still pursuing Nixon. He visited campus in December, never committed, and things went very quiet. Overton is fresh off a visit to Liberty this weekend. The Bessemer Academy and Tuscaloosa, Alabama product also has offers from UConn, UAB, Arizona State, and several other FCS schools. His mom played volleyball at Kentucky while his dad played football at Oklahoma and is currently the athletic director at Kennesaw State. Boyd is from Sacramento where he attends Capital Christian. He visited Indiana during the last weekend of January and was expected to make his way to Lynchburg. That visit never materialized. In addition to the Hoosiers, he’s also considering several Ivy League schools. Williams visited Liberty on January 18th and then followed that up with a visit to Indiana on the 25th. After picking up an offer from Arkansas State just last week, he visited there and committed. Keep an eye out for a surprise name that could sign with the Flames as well. It should be a fun Wednesday. Loving all this coverage! Thanks for the updates, this is the most excited/interested I’ve ever been in a recruiting day! Any chance you could summarize when it’s all said and done this week what the total count of 2 and 3 (and 4?!) star recruits are in this class compared to previous years? Would love to see the impact Freeze and the FBS are having.